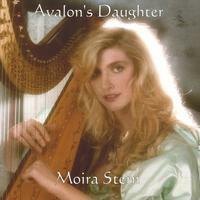 Moira Stern sings and accompanies herself on the pedal harp. She sings in French, Italian, German, Latin, Spanish, Scottish and Irish Gaelic, and numerous native dialects. An award-winning Gaelic singer with a nearly five octave range, she specializes in the folk songs of Britain and Ireland. When she was four, her mother noticed that Moira had perfect pitch, and could sing back any tune on the first hearing, whether an aria or a Gaelic folksong. She began memorizing folksongs at the age of six, and had amassed an enormous repertoire by her teens. From records and books, she taught herself to sing in Gaelic, and developed a passion for the harp. She played the harp in restaurants professionally for ten years. Moira started memorizing operas in all languages at the age of ten, with Mozart's "Die Zauberflöte." She began formal vocal training at the unusually early age of fourteen. She joined the Renaissance Faire at the age of nine. She sang and played the harp, led hundreds of parades, and directed Shakespeare plays and Irish dance shows. She earned a Bachelor of Music Performance degree from the University of Redlands, and did postgraduate work in Reno, Nevada. While in Reno, she taught both harp and singing, and directed the Celtic Youth Chorus in Riverdance-style shows, where they sang in Irish Gaelic. Many singers have studied another instrument, but very few singers accompany themselves on the concert harp; fewer still would even attempt to sing opera while doing so. As a result, Moira's talents have been in constant demand ever since she became a professional performer. Moira has worked with award-winning vocal coach James Meredith, international opera star Olivia Stapp, Marjorie Call, harpist and wife of harp composer Carlos Salzedo, and Margie Butler, renowned harpist and singer from Golden Bough. "I think your voice is better than Beverly Sills. This album is rollicking fun, absolutely bang-up!" This album touched something very deep in me. "Your CD arrived today. I played it immediately and it is quite beautiful. I love the choice of songs and the clarity of your voice - not to mention the fine harp playing. The instrumental piece - Lament - is lovely and very haunting. You are truly a maker of beautiful music. I'll be playing it constantly for the next few days"
"Moira has the most beautiful voice I have ever heard"
"People were still buying the albums and talking about the show the next day. It was wonderful!" lovely voice and accompany yourself beautifully. " "You made me cry. It's gorgeous." "Man! I wish I had written that!" "You knocked our socks off!! This is a truly amazing album by a truly amazing artist. I understand she is also the daughter of a famous author. Enchanting, lovely, inspiring and unforgettable. I'd love more!